Ancient Sumerian astrologers worked with constellations and stars far more than we do today. The constellation Libra, which looks like a lopsided diamond and which is now placed in astrological Scorpio, was called by the Sumerians The Gateway. 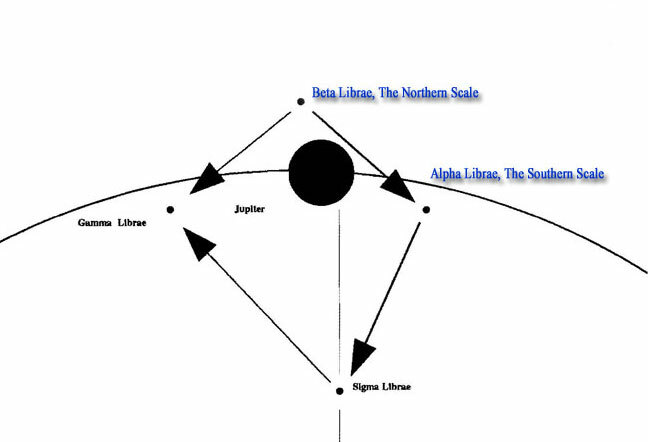 Alpha Librae and Beta Librae, the South Scale and the North Scale of the Balance, sit right on the ecliptic path. The Sun and Moon and planets must pass through this gate, and it functions as a karmic door, through which all must pass, to be balanced, weighed, and judged. If one were born with a planet located at the same longitudinal position of either the North Scale or the South Scale, the part of personality ruled that planet would be profoundly influenced for the whole life. The star at the top of the diamond was supposed to be the “good” one; the one lower down, representing the scale out of balance, was supposed to be the “bad” influence. In our more conscious times, astrology might say it this way: if a planet is found on the “out of balance scale”, one may have to work at keeping that part of personality on an even keel. Researching history and examining the charts of those who are blessed by good fortune, I have found that star at the top of the Libra diamond, known as the Northern Light, the North Scale, Zubeneschamali, does indeed confer grace and good fortune. More recent ancient astrologers all agreed upon the beneficent influence of the North Scale. Nothing is “fixed” in the sky. The stars move through the sky, whether from precession or from proper motion or due to other motions; through long eons patterns in the sky change. 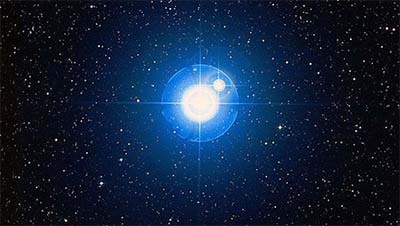 In examining Beta Librae, we must take into account the movement (proper motion) of this star. With a few simple calculations, we determine that this star was astrologically located at 16° 21′ of Scorpio in 1769, when Arthur Wellesley, later to become the Duke of Wellington, was born (see attached chart). The North Scale is located a little more than two degrees away from the birth position of Wellington’s Jupiter. Wellington was born when the Sun and Earth and Jupiter (and Uranus, but we are not going to discuss that here) were configured in their orbits in a straight line. He was, like Andrew Jackson, born at the time of the astronomical opposition of Jupiter. When this opposition became exact, five days later, Jupiter was exactly conjunct the North Scale. This is the chart of one of the most powerful men in history. Wellington was the general who defeated Napoleon Bonaparte at Waterloo (June 18, 1815). He never lost one of the thirty battles he fought, either in India, or in Spain or later in Belgium. He also pursued a career in politics, serving several years as Prime Minister of Great Britain. An examination of the Duke of Wellington astrology reveals a grand trine with the outer planets, Uranus, Neptune and Pluto, all in a dialogue to the Sun. He had a Mars/Saturn opposition to Pluto on the ascendant, which imparted to him an enormous stamina, and willingness to fight. 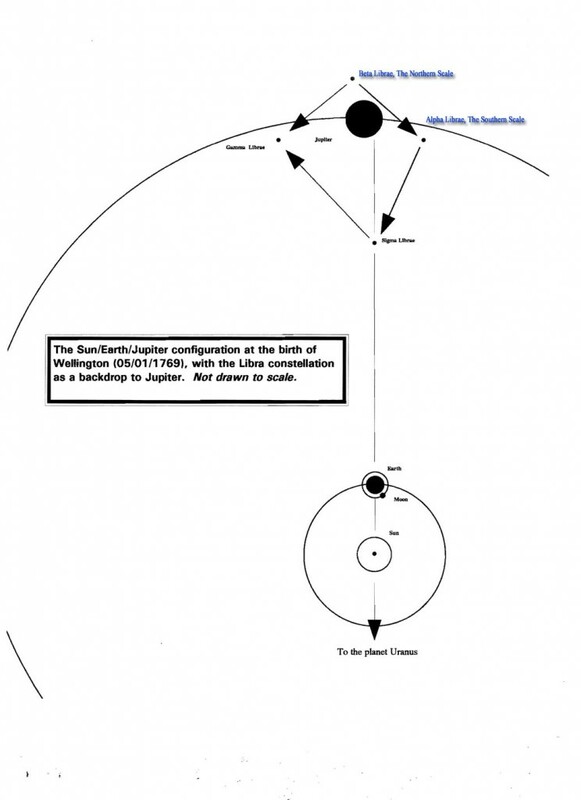 Still, the strongest aspect would again have to be that Jupiter/Earth/Sun. It is stronger than the two grand trines; perhaps it enhanced and gave focus to their power. Napoleon had a grand trine involving Mars, Uranus, and Pluto. It was his genius for war. He used it reorganize the laws of France, called the Code Napoleon and still in existence. He hoped to create an aristocracy of ability would dominate Europe for centuries. He almost succeeded. 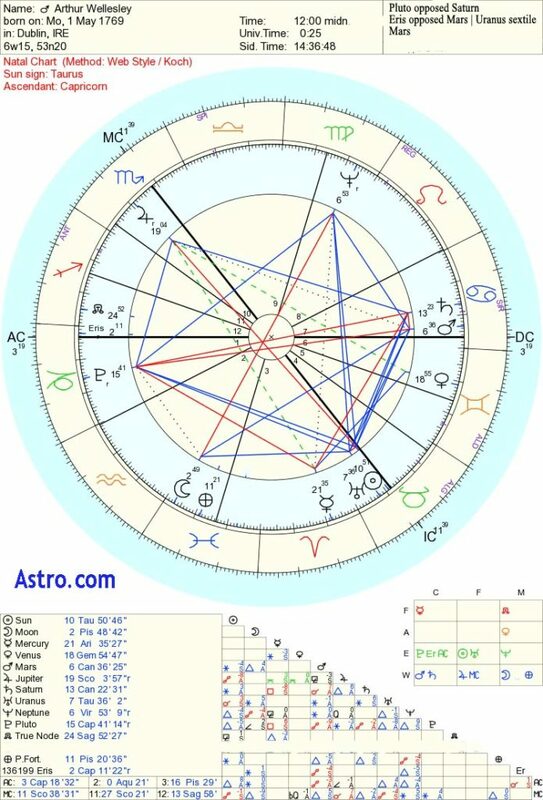 But his chart did not have a Jupiter/Sun/Earth opposition. Wellington was born Arthur Wesley (later changed to Wellesley) in Dublin, Ireland, May 1st at midnight, 1769. As he described himself later, he was a “sprig of nobility”. He grew up a dreamy, shy child. Like his father, he was somewhat gifted musically. One often finds a birth into higher levels of society when Jupiter is the dominant planet in the chart. When Wellington was twelve years old, he was sent away to Eaton, an upper class British boarding school. Then he attended other schools in France. The younger son of a not-so-well-off gentleman, he chose a career in the military. Just enough money was available in the family to allow him to purchase commissions in the army, which was the practice at that time. Between 1787 and 1793 he rose in rank from ensign to lieutenant colonel. In 1796, Wellington decided to take service in India. The reasons for his decision are somewhat obscure. Careers and ambitions often foundered and died out there. It was nearly impossible to advance in rank, since all promotions came out of London, thousands of miles away. Many officers went to India, and found that their lives dwindled away into oblivion. Yet his older brother Richard was Governor General of India, and advancement was not completely impossible. Wellington, a twenty-seven year old lieutenant colonel, prospered. At this time the British were consolidating their rule of that country. In India, Wellington trained himself to be a battlefield commander. He taught himself to go with minimal sleep, sleeping often on the ground with little covering and only a newspaper to keep the sun out of his eyes, to eat sparingly or not at all, to ride a horse for long, hard hours. He had been sickly as a child, but in India he developed an iron constitution. Wellington, from his studies, his thoroughness of preparation, and his general affinity for war (Mars/Saturn opposed Pluto), and the luck every great general must possess (that Jupiter/North Scale) began winning battles as a battalion commander, and then was made a general. In one battle, Assaye, with 7000 men under his command, he attacked an enemy numbering 200,000. He was fully exposed to enemy fire for several hours. He had two horses shot out from under him that day. Riding from commander to commander giving orders to each of his six battalions, Wellington constantly crisscrossed the battle field to reconnoiter the enemy. He matched swords with the enemy, and finally routed the Indian army. Wellington always remained protected in situations of extreme danger to his life. How? He was always found at the most deadly part of the battle, mounted on his horse. He seemed to be an easy target for muskets and artillery. In all his thirty battles, he was constantly on the front lines where the fighting was thickest. Bullets penetrated his clothing. They bounced off his body, at times knocking him to the ground. He was under fire more often than the NCO’s and enlisted men who served under him. A review of his career shows that he was under fire a thousand times as much as those who served under him. Yet only one time was he ever wounded. In the Peninsula Campaign in Spain, in the Battle of Orthez (27 Feb. 1814), a musket ball hit his belt buckle and, bouncing off his thigh, left a deep bruise. He complained bitterly about it. How was he seemingly “protected”? The answer is found in that powerful Jupiter, a part of his grand water trine, sextile Pluto, and biquintile Mercury. The only “inharmonious” aspect in his chart is connected to his Venus. History records that he had an unhappy marriage. Jupiter in the astronomic opposition would be enough to confer protection in times of extreme danger. Configured with all the other planets so closely, it gives a magnitude of protection as strong as any that I have ever seen. Wellington began his military experience as a commander in Flanders in 1794 fighting the France, a little before the beginning of nineteenth century, at a time when a tyranny threatened to engulf Europe. The embodiment of this tyranny was Napoleon. An equal and opposite counterbalance was needed. It appeared in Wellington, a man who was solid and grounded, a man who was able to preserve his presence of mind in the most life-threatening situations, someone naturally and completely at home in war. Jupiter is the largest planet in the solar system; its mass is 317 times that of the Earth. While traditional astrology has for thousands of years assigned it the quality of beneficence, I feel we have more to learn about Jupiter. One of the qualities Wellington demonstrated so nobly in his life was leadership. This attribute has been assigned to Saturn, and Mars and the 10th house, and to the Sun. Those assignations are not wrong. Saturn is the archetypal representative of the king, the dictator, the president, the executive who carries out the law, the karmic enforcer, even the police. J. Edgar Hoover (who may have had Saturn in the 10th), Director of the Federal Bureau of Investigation from 1927 to 1972, was a saturnine power (he was perhaps representative of its darker side) in American politics; John Kennedy had Saturn placed in the 10th house, and Abraham Lincoln had it elevated at the top of his chart. The placement of Jupiter in a chart can suggest qualities of leadership as much as does Saturn or the Sun. Its traits involve speed and swiftness in decision making. In those quick choices Wellington made on the battle field, he was using that powerful Jupiter. It was the Jupiter that enabled him to grasp the real need of any situation, to understand its wholeness, to see its over-view. Duke of Wellington. Click for larger. At the Battle of Waterloo, he was constantly riding his horse, named Copenhagen, along a two-thousand-yard front. He rode in a cloud of artillery shells and flying musket balls, ordering in reinforcements where needed, and commanding others to withdraw, constantly repairing damage to his lines. It was Wellington who chose the site of the battlefield at Waterloo; it was Wellington who held his troops together all day and well into the early evening until it was time to hunt down Napoleon’s exhausted and defeated army. Over this 3/4 mile battlefield he sat on his horse for nearly twelve hours. He was able to ride swiftly (his horse was the grandson of one of the fastest racehorses of the eighteenth century). He made a thousand instantaneous decisions, anyone of which, if it had been wrong, might have led to the destruction of the entire allied army he led. If that had happened, our world would be different today. 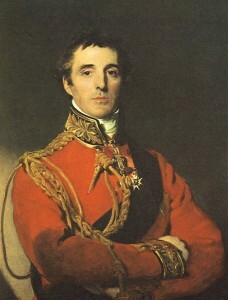 Wellington was always at the thickest of the fighting, often watching it from his horse, but staying with his infantry. Sometimes he had to use the protection of an infantry square (this was a tactic wherein soldiers with firearms faced outward would form a square; it was one of the most impenetrable devices on a battlefield). When he came into contact with French cavalry and they chased him. He later told his sister-in-law, “The finger of God was on me all day—nothing else could have saved me.” Both statements are true—no one else in Europe could have defeated the military power of France. Wellington had divine protection. The Battle of Waterloo began at about 11:30 AM, when the French attacked Hougoumont Chateau. A chart for this battle shows a Mars/Pluto conjunction in the house of open opposition, the seventh house. Mars and Pluto are the rulers of warfare. The conjunction says that something new is beginning (possibly a hundred years of freedom from any major war in Europe). Uranus and Neptune are approximately 14° apart, in a loose conjunction, and are parallel. Waterloo marked the final destruction of a military aristocracy that attempted to dominate Europe. In Wellington’s chart the placement of the Sun on that day falls on his line of the nodes, giving him the ability to draw on all past knowledge. Transiting Saturn is two minutes off a third quarter square to his Sun. Waterloo was the greatest challenge of his life. He was also finishing things up. This square from Saturn to the natal Sun has to do with functioning well, often with mastery, in the outer world, but in the inner world, one desires change. After Waterloo, he never fought another battle. When the Battle of Waterloo began, the transiting Moon was within a one degree conjunction of his natal Jupiter. What could be more powerful than that? That was his “finger of God”, his protection. The leadership qualities of Jupiter are necessary for certain functions of state. War is one of those functions. To prosecute war successfully requires a need to see what has to be done quickly in an overall situation, and then to take swift action. This is an activity of Jupiter.